This collection of essays features research first presented at a session sponsored by the Association of Historians of American Art (AHAA) entitled “Art and Invention in the U.S.” at the College Art Association annual conference in Washington, DC in February 2016. In many ways, Washington, DC was an apt setting for consideration of the intertwined notions of art and invention; the capital of the nation is home to the Smithsonian American Art Museum and National Portrait Gallery, which together occupy the former home of the United States Patent Office, which was conceived of as a “temple of invention.” Hallways that once bustled with the work of patent examiners and eager applicants, filled with cabinets that housed patent models and technical drawings, now host a national art collection, visited by over one million people a year. Fig. 1. 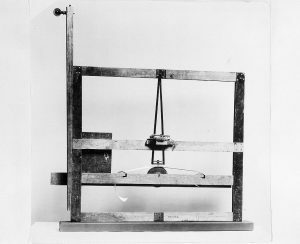 Morse’s Experimental Telegraph. Photographer and date of photograph unknown. Smithsonian Institution Archives. Image #91-3689. Art and invention have long been intertwined in American culture. 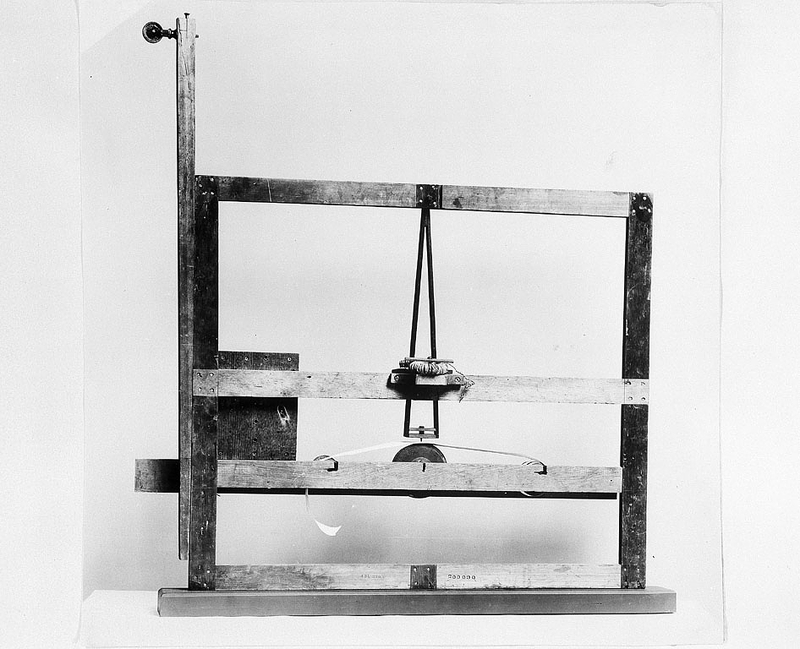 A few years after the exhibition of his Gallery of the Louvre, painter Samuel F. B. Morse (1791–1872) adapted one of his canvas stretchers to create the prototype of a telegraph receiver, literally transforming a tool of his art practice into a medium of technological experimentation and invention (fig. 1). Over the course of the industrialization of the nineteenth century, the United States government revised and formalized procedures for granting patents and copyright, thereby changing public perceptions about creativity, invention, and intellectual property and creating entirely new careers for artists: patent examiners, model makers, and technical illustrators. Patents proliferated and inventions were eagerly heralded in the popular press and public demonstrations. The very act of perception was altered by technology as well, via new visual spectacles, environments, and experiences. Technological developments have profoundly changed all aspects of artistic production, consumption, and display; industrially produced pigments and supports altered the process and materiality of painting itself, and photography and chromolithography yielded entirely new media, fostering competition and leading to anxieties about the status of art. Furthermore, new technologies such as the telegraph and the steamship (whose inventors, Samuel Morse and Robert Fulton, were also painters), and later email and text messaging, allowed for increased and rapid transmission of ideas and images around the globe. Innovations, such as artificial lighting, affected the display of art, and new exhibition formats, such as patent museums, world’s fairs, and programs coordinated with the international forum of the Olympic Games, juxtaposed painting and sculpture with the latest technological developments, from steam engines to X-ray machines, and from robots to personal computers. The original CAA session brought together five papers that examined the intersection of art and invention, and innovation and experimentation in American art from the early nineteenth-century to the 1980s, exploring this surge of inventiveness from art historical perspectives and considering works of art through the lens of the history of technology. The session asked: How did new media alter expectations for art and industry? What relationships developed between artists and inventors, and what was at stake in the dialogues between art and invention? How did inventions and patent processes change the look of modernity, and how was American identity shaped by the production of art and inventions? In this special issue, we present three of those innovative papers from the session. Elizabeth Bacon Eager proposes a deft consideration of artist and engineer Robert Fulton and his explosive ideas in a paper that also investigates early nineteenth-century metaphors and conceptions of innovation, manufacturing, and creativity. Laura Turner Igoe examines the late nineteenth-century fascination with the possibilities of capturing lightening in photographs and harnessing the power of electricity. While the first two essays explore nineteenth-century invention as an individual enterprise and a promethean ambition to tame nature, the essay by Cary Levine and Philip Glahn considers the 1984 Electronic Café in Los Angeles as a collective, critical response to the potentially controlling, oppressive aspects of technology, a topic that resonates within its original historical moment as well as in our contemporary lives. A recurring theme of the presentations and discussions concerned the ways in which new communication technologies, from the telegraph to computerized networks, shaped the creation, circulation, and reception of works of art. In this sense, a twenty-first-century online journal seems a particularly appropriate medium in which to publish these essays on art and invention. We look forward to seeing the ways in which Panorama itself shapes the field.